Count me in as yet another 308 AR wanter, yet not purchasing anything due to the confusion. Good rails are available. Look at the Centurion Arms rails in 308. Also, Daniel Defense makes a 308 rail. They have decided to discontinue it, but you can still buy it on their site I think. I would do the Mega arms receivers. Last edited by weg111; 11-03-14 at 08:32. Same boat, basically what I'm loitering around waiting to do. I'll probably be such a low round count user that I could run a 7" Ti can and get away with it. I'm still mystified that both RRA and Wyndham seem to get their own custom models from MI on the SS-KM handguards. I guess there's a market, which means some of them are out there, but I can't really understand why folks are actively buying 308 AR's from companies that can't make 5.56 ones run (DPMS ones will run, just have higher lemon rates and lower MRBF, but they at least don't do embarrassingly stupid things like eat their own triggers, and be only compatible with themselves). I pieced together a .308 gas gun and I'm really happy with the results. It was my first build. I wanted a rifle that could do a little bit of everything--fun on a bench, light enough to hunt a little-- the cliche RECCE. It's light, no issues through 300 rounds, and more accurate that I can shoot. I used some JP Rifles parts that might not be the norm around here. First trip in the field with it. I took this standing from about 70 yards. Last edited by Kev; 11-02-14 at 16:41. Nice piggy. I hope he was tasty. Kev - my design parameters are a lot like yours. Something I can put a 1-8X optic on, or add an Aimpoint and slay swine with it. I'm still debating the 16" versus 18" barrel. The Ultra Match looks quite desirable. And a can is very high on the list as well. 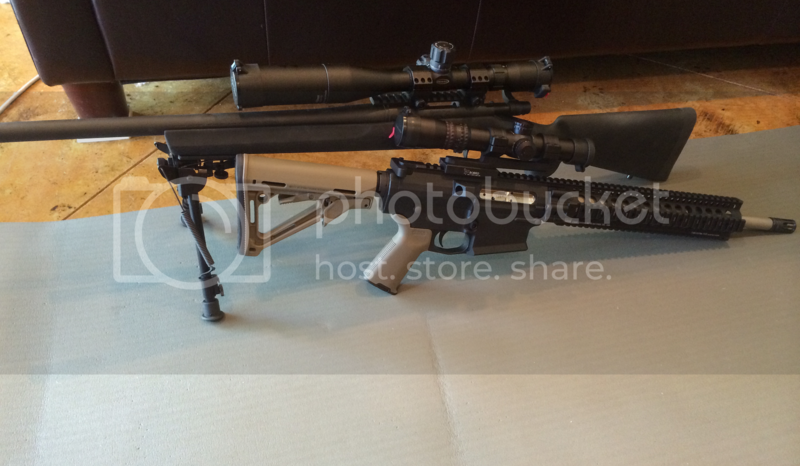 The scope I have on there is the 2.5-10x24 Nightforce. Keeps the weight down. I need to try an Aimpoint on it. I read through some threads on here and decided that there was very little to be gained by going over 16 inches and a lot to give up in terms of versatility gained with the compact barrel. Here are two that I read Link 1 and Link 2. It was a blast to carry on the pig hunt. I was on 6,000 acres of hills and it was light and easy. Hardly noticed that I didn't have a 5.56. Cool, thanks for the data, it is useful. I already have a Remington 700 .308 bolt gun, which also makes me lean toward the 16" for the gas gun. If I wish to smite a creature some great distance away, I'll use it. That NF is very sweet, it's on my optic list as well. I was going to get a Bobro mount for the scope, and a Bobro for the Aimpoint. That way I can pretty much swap them without too much concern for the zero. 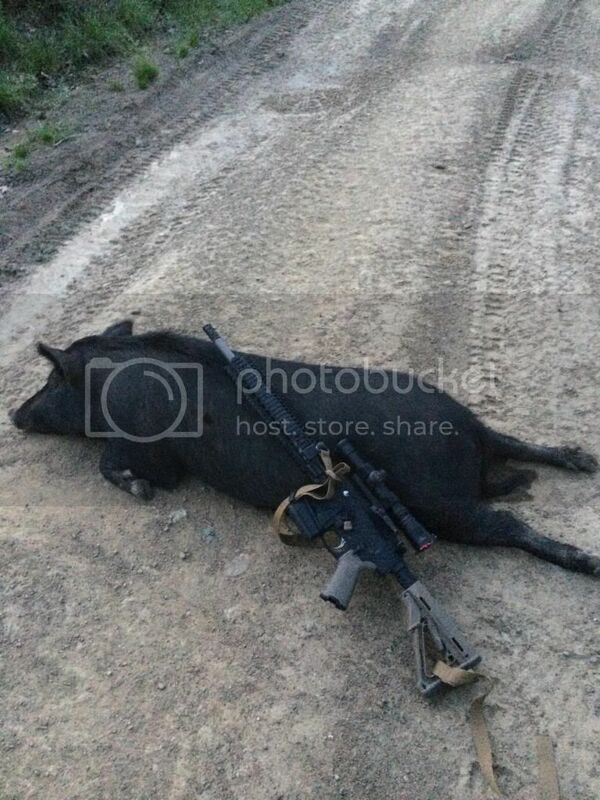 Good luck on the future pig hunts, it sounds like you have a terrific setup and a great location. All you need now is one of those big smoker pits on a trailer!